When I treat someone using foot reflexology, the feet give away where there are areas of stress in the rest of the body. Sometimes you can tell just by looking – hard skin, blisters and redness are all tell-tale signs – but otherwise they communicate when you touch the reflexes. 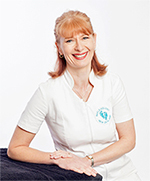 I am passionate about reflexology because to me it is such a comprehensive way to provide holistic healing both physically and energetically and the best part is that everyone can benefit; from babies, to teenagers, to expectant mums, prospective fathers, hard workers, retirees – everyone! It is so rewarding to see the positive changes in someone as they start to find balance in themselves again, knowing that someone has heard them, felt their ills and treated their discomforts with love, nurture and respect. My journey to being a reflexologist has also led me to train in other modalities so I can also offer massage and energy healing. I love being able to help people in life and am always trying to find solutions and make things better, It is such a privelege to be able to do that as part of your job.